There's no company in the world quite like Amazon (NASDAQ: AMZN). The tech giant regularly stretches its tentacles into new industries and seems to defy categorization. Its popularity is undeniable, and its stock price is correspondingly sky high. Are any of Amazon's rivals worth considering instead? Amazon is best known as an online retailer, generating most of its revenue from e-commerce sales, but Amazon also has other significant businesses, including cloud computing, video streaming, e-book readers and tablets, book publishing, Alexa voice-activated technology and related devices, and advertising. While the bulk of its revenue comes from e-commerce, its cloud-computing division, known as Amazon Web Services (AWS), actually makes up more than half of its operating profit. Cloud computing is a much more profitable business than the e-commerce industry Amazon has come to represent. E-commerce is the online buying and selling of goods, usually on a marketplace or platform like the one Amazon owns. Amazon dominates U.S. e-commerce, largely thanks to its aggressive expansion, its reputation for excellent customer service, the Amazon Prime loyalty program, and the culture of invention and experimentation fostered by CEO Jeff Bezos. The behemoth claims nearly half of the market. Amazon is expected to control 49.1% of U.S. e-commerce sales in 2018, up 43.5% from the prior year, according to eMarketer. Its strong position has been fortified by Amazon's Whole Foods acquisition and rapid growth of the company's third-party marketplace. Its e-commerce market share dwarfs that of its closest competitor, eBay (NASDAQ: EBAY), at 6.6%, while Apple and Walmart (NYSE: WMT) follow at 3.9% and 3.7%, respectively. E-commerce as an industry continues to take share from brick-and-mortar retail, with online sales in the U.S. growing about 15% per year since the recession, while overall retail growth, which includes e-commerce, has averaged just 4.3%. Amazon's e-commerce strength lies in its first-mover advantage in the naturally growing e-commerce world. It opened hundreds of fulfillment centers to support its free two-day shipping promise for U.S. Prime members, and it's on track to bring in more than $200 billion in revenue this year. The company's strength in e-commerce has allowed it to support its other businesses, like Amazon Web Services (AWS), which emerged from the company's in-house project to manage its online retail business. Amazon embraced cloud computing early, essentially as a way of managing computing needs like software and storage from an off-site source, and AWS is now a major provider of such services for a vast array of companies, helping Netflix facilitate its video streaming and Airbnb easily scale its home-sharing marketplace. According to Amazon, AWS presents customers with a "broad set of global compute, storage, database, and other service offerings." Amazon has also developed video and music streaming, which are free for Prime members, to entice more members to its loyalty program since Prime itself is an incentive to order more products from Amazon. Gadgets like its Fire tablet and the Alexa-powered Echo devices make ordering products on Amazon easier, and the draw of its website has enabled it to add on high-margin businesses like its third-party marketplace, where other vendors also sell on Amazon.com, fulfillment by Amazon, and a burgeoning advertising business. Unsurprisingly, Amazon's size, reach, and penchant for experimentation has put it in competition with an incredibly long list of companies, big and small, across a variety of sectors. As Amazon enters and disrupts more industries, new competitors will join the ranks of its largest rivals. Which companies are Amazon's biggest competitors? Below, we'll examine each of the industries from which Amazon draws competitors and its closest rivals in each sector. Amazon competes with most U.S. retailers, to some degree, because it sells everything under the sun. Although Amazon is primarily an online retailer, it competes directly with physical stores, most of which also sell their products online. Sales on Amazon.com take away from retailers' total sales, comprised of online purchases and purchases in physical, or brick-and-mortar, stores. No company competes more intensely with Amazon than Walmart. Walmart was Amazon before Amazon existed. The superstore giant boasts massive economies of scale, a wide selection, and bottom-of-the-barrel prices, just like Amazon. Both companies are known for being near-monopolies. Walmart still generates significantly more retail sales, but Amazon has stolen its reputation as the leader in wide selection, low prices, and convenience. Walmart's growth even ground to a halt when revenue fell in fiscal 2016 for the first time in at least 35 years. As a result, the brick-and-mortar giant has been forced to play catch-up, and it has made many strategic changes under CEO Doug McMillon. It has stopped opening new stores in the U.S., instead investing the capital into improvements at existing stores, like higher wages and better training, making sure items don't go out of stock, and cleaning up stores to make them more presentable and shopper-friendly. Walmart has also staked its future on omnichannel capabilities, the combination of online and offline assets to serve customers by doing things like adding thousands of grocery pickup stations and several hundred Pickup Towers, which are stations inside stores that dispense online orders. Walmart has also made grocery delivery available from nearly 1,000 stores, and it offers free two-day shipping on orders with a $35 minimum with no membership fee, marketed as an alternative to Amazon Prime. Following its acquisition of Whole Foods, Amazon has become much more of a direct competitor with Walmart in groceries as Amazon also offers free delivery to Prime members in some areas from Whole Foods and gives in-store discounts to Prime members. It's planning to expand Whole Foods and its own delivery capabilities. Finally, the retailer has gone on a shopping spree for e-commerce companies. It first acquired Jet.com in 2016, bringing in founder Marc Lore to run its domestic e-commerce operations, and since then, it's focused on picking up digital-first clothing brands like Bonobos, Moosejaw, Modcloth, and Shoebuy. As a result of those moves, Walmart's U.S e-commerce growth has surged and is on track to deliver a sales increase of at least 40% for the second straight year. Comparable sales have seen solid growth as well, a sign that its strategy is paying off. Walmart is also set to top Amazon as the nation's largest online grocery seller. Meanwhile, Walmart set itself up for a showdown with Amazon in India after acquiring a majority stake in Flipkart, the leading online retailer in the sub-continent. Amazon is close behind in the fast-growing market, and the two are expected to compete closely as the Indian economy develops. With Amazon at the verge of becoming the second-biggest retailer in the U.S., behind Walmart, and the two facing off in India, it's clear that Walmart has become Amazon's biggest competitor as no other company has more to lose from the e-commerce giant's ascent. However, Walmart is far from the only brick-and-mortar retailer battling Amazon. Costco, another one of the biggest domestic retailers, has also sought ways to fend off Amazon's retail rout. Costco and Amazon are often seen as parallels because both have membership programs central to their businesses. Amazon Prime, which offers free two-day shipping on millions of items, among other benefits, costs $119 a year, and it has been perhaps the biggest driver of Amazon's monster growth over the last decade. Similarly, Costco stores are only accessible to members who pay a $60 annual fee for access to its bargain-priced bulk goods. Costco sells its merchandise close to the price it pays suppliers for the goods, and it makes the majority of its profit from membership fees. Because of the membership fees, both companies tend to attract higher-income consumers, and since Costco's stores are primarily located on the coasts, they tend to compete more directly with Amazon than Walmart stores do, which are more concentrated in the southern and rural parts of the country. Though Costco has performed better than most retailers in the face of the Amazon threat, the wholesaler has been forced to adapt. In October 2017, the company launched free two-day delivery for around 500 non-perishable stock-keeping units (SKUs) with a $75 order minimum, and it also partnered with Instacart to offer same-day delivery on groceries with an order minimum of $35. Costco recently began reporting e-commerce sales and has delivered strong results, with e-commerce sales up 32% in fiscal 2018. Though its stores continue to attract high customer traffic, the warehouse operator may have to make further changes to stave off the threat as Amazon and other e-commerce operators like Boxed continue to innovate and e-commerce continues to get easier and more convenient. Finally, Target is Amazon's last significant brick-and-mortar competitor. Like Walmart, Amazon, and Costco, Target sells a wide range of products including groceries, apparel, home goods, and electronics, and like the other two physical retailers, Target has been busy making moves to defend its market share. A year ago, Target acquired Shipt, an Instacart competitor, which has helped the big-box chain bring same-day delivery to more than 1,400 Target stores, about two thirds of its total. Recognizing that fast, free shipping is now table stakes in e-commerce, Target upped the ante this holiday season, offering free shipping with no membership fee or order minimum on hundreds of thousands of items, a move that prompted Amazon to get rid of its $25 order minimum for free shipping for the holiday season, though the e-commerce king did not promise two-day shipping. Target is investing in remodeling stores and expanding small-format stores in areas like underserved urban neighborhoods and college towns, where its model is a good fit. Target's investments and e-commerce efforts have paid off so far, as the company delivered its best in-store traffic growth in more than a decade, and e-commerce sales are surging, up 49% in the third quarter of 2018. Amazon has grown so large that its biggest retail rivals are brick-and-mortar store chains, but the company is also challenged by smaller Internet-based companies like eBay and Etsy. Despite its tepid growth in recent years, eBay is still the second-biggest online retailer in the U.S., and it's arguably Amazon's oldest competitor. In its early days, the online shopping and auction site mostly kept pace with Amazon's sales growth, as illustrated by the chart below. However, over the last decade, online shopping has moved away from eBay's core strength as an auction business and toward mass-market retailers better equipped to serve shoppers' everyday needs. A number of factors have played a role in this shift, including increasing competition and the changing way consumers use the internet. Many seem to have simply lost patience with online shopping, and the gamesmanship of the eBay auction is no longer novel. The company itself started downplaying the auction element in 2008, but today, eBay still claims a significant share of online sales, racking up $94.3 billion in gross merchandise volume over the last four quarters. More so than any other company, eBay competes directly with Amazon for third-party sellers to join the marketplace platform. By gross merchandise volume, eBay has the second-biggest online marketplace in the U.S. with 25 million sellers on its platform, significantly more than Amazon's estimated 2 million sellers. It's much easier to set up a sales account on eBay, and eBay has centered its strategy on making the platform easier for sellers so it can drive the kind of third-party sales growth Amazon has. Amazon's marketplace has been one of its most valuable growth engines as revenue increased 31% in the third quarter of 2018 to $10.4 billion. That growth was much faster than the 10% rate it saw from its online stores, or what it calls direct sales. Since marketplace revenue is more profitable, the category is an important one to Amazon, and eBay remains its closest competitor in the area. Online crafts seller Etsy is significantly smaller than Amazon, with revenue of just $540 million over the last four quarters, but the company deserves a mention because it has survived -- and even thrived -- following a direct challenge from Amazon, which launched copycat Amazon Handmade in October 2015. With the help of new CEO Josh Silverman, the artisan-focused online retailer made a number of changes to beat back the Amazon threat. Etsy stepped up its efforts to help merchants deliver fast, free shipping, especially during the holidays, when it's crucial for gifts to arrive by Christmas. Etsy charges its sellers much lower fees than Amazon, and it has added tools to improve the ease of selling on the site, allowing vendors to collect funds at the time of sale rather than when the product ships (the way Amazon does). Etsy's regulations on sellers are also less onerous as it allows them link to outside websites and collect email addresses for newsletters, as opposed to Amazon, which forbids such tools. As a result of those initiatives, Etsy sales have accelerated this year, and the stock has nearly tripled. Its success offers a blueprint for other online marketplaces battling Amazon's encroachment. 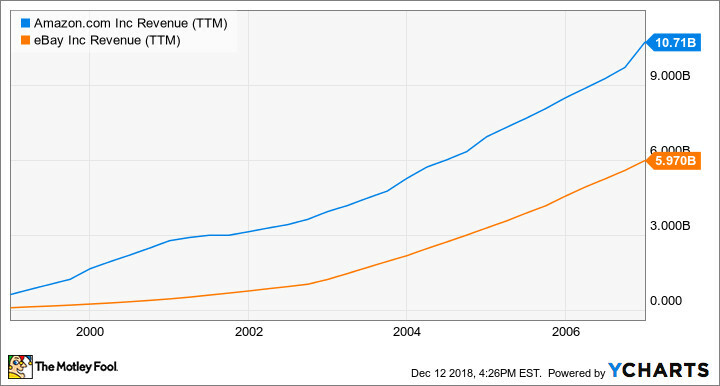 While e-commerce has been Amazon's biggest business since its inception, cloud computing now makes up a majority of the company's profits and is a key growth driver. The emergence of Amazon Web Services (AWS) is another reason for Amazon's stock jump of more than 400% over the last four years. Revenue from the AWS segment was up 48% through the first three quarters of 2018, to $18.2 billion. In the tech arena, Amazon's biggest rival is Alphabet, and the two tech giants are battling on multiple fronts. In 2014, Google's former executive chairman, Eric Schmidt, called Amazon his company's biggest competitor, saying, "Many people think our main competition is Bing or Yahoo. But, really, our biggest search competitor is Amazon." It's easy to see why. The most valuable searches on Google, Alphabet's e-commerce and search engine subsidiary, are for products because those searches are usually made by consumers ready to spend money. Naturally, these searches command high advertising rates. However, more people searching for products are starting their quests directly on Amazon instead of using a search engine like Google. Amazon's challenge to Google has only increased as it's grown and made its own push into advertising. Much in the way Google sells ads, Amazon has begun placing sponsored listings on its product search pages, encouraging businesses to pay to position their merchandise more prominently on Amazon.com. Amazon has sold digital advertising space for a number of years, but only recently has it ramped up its efforts, capitalizing on the vast data its has on consumers' shopping habits and preferences. Since Amazon.com is often the first site online shoppers go to when they want to buy something, space is very valuable. Amazon is now the third-biggest digital advertiser behind Google and Facebook, and its ad business is growing fast. Revenue from Amazon's "other" segment, which is primarily made up of ad sales, jumped 122% in the third quarter of 2018 to $2.5 billion. Alphabet has sought to push back on Amazon's incursion on its search dominance by launching its own delivery service, Google Express, and partnering with Amazon's brick-and-mortar rivals. Though Google Express signed up retailers including Walmart, Costco, and Target and seemed to have real potential, the service has largely fallen flat. Google Express introduced its shopping service in 2013, and it has gotten tripped in multiple ways since then. It initially offered perishable grocery delivery but suspended it in 2014; it closed its delivery hubs in 2015 and ditched its subscription model in 2017, along the way losing much of its talent and momentum to rivals like Uber. Meanwhile, retailers have invested in their own logistics and e-commerce infrastructure as Google had little to provide in the way of hard assets other than technology and temporary labor. Amazon and Alphabet have also been butting heads on voice technology. Amazon Echo and Google Home are the two leading smart speakers intended for use in the home. Amazon had 41% share of the global smart-speaker market, compared to 28% for Google, as of the second quarter of 2018. Considering the potential for smart speakers and voice-activated technology, this battle between Amazon and Alphabet is only just beginning. Market research firm Grandview Research estimates that the global speech and voice recognition market will reach $32 billion by 2025. Like many other big tech companies, Amazon and Alphabet are also facing off in cloud computing. AWS is widely considered the leader in the fast-growing industry, on track to bring in $25 billion in revenue this year. AWS is the preferred choice among businesses, according to cloud management company RightScale, with 68% of responding businesses saying they use AWS applications. Microsoft Azure came in second at 59%, followed by Google Cloud at 19%, though 41% of respondents said they were experimenting with Google Cloud apps or planning to use them. Alphabet doesn't break out cloud sales, but Google CEO Sundar Pichai said in February 2018 that it had achieved a $4 billion revenue rate, which has likely increased since then. In its 2017 annual report, Alphabet identified Google Cloud as the biggest driver of growth in "other revenue," which rose 42% from $10.1 billion in 2016 to $14.3 billion last year. Amazon and Alphabet have similar market caps and revenue growth rates. However, Alphabet has the distinct advantage when it comes to profit, with more than double the net income of Amazon over the last four quarters -- $18.8 billion compared to $8.9 billion for Amazon. That should give Alphabet an advantage as it seeks to narrow the gap with Amazon in cloud computing and voice technology, and defend its search advertising dominance. Alphabet spent $16.6 billion on research and development in 2017 (Amazon doesn't report R&D expenses). If Alphabet is spending more than Amazon on R&D, that's an advantage the Google parent can use as it battles Amazon on multiple fronts. When it comes to cloud-computing competition, Amazon's closest competitor is generally considered to be Microsoft, which has a cloud service called Azure that competes directly with AWS. In total cloud revenue, Microsoft is actually ahead of Amazon as its commercial cloud segment, which is made up of Office 365 commercial, Microsoft Azure, Microsoft Dynamics 365, and other cloud properties, grew revenue by 56% to $23.2 billion in the fiscal year ended Sept. 30. Microsoft doesn't break out specific revenue for Azure, which offers similar infrastructure-as-a-service capabilities as AWS, but Azure revenue jumped 91% last fiscal year. Microsoft is the preferred provider of cloud computing for companies that compete with Amazon but still have cloud-computing needs. They don't want to fund the competition, so instead they opt to support alternatives like Azure and Google Cloud. Walmart teamed up with Microsoft on cloud technology, artificial intelligence, and machine-learning initiatives, and it has also told some of its tech suppliers to get off of AWS, saying it doesn't want sensitive data on a competitor's platform. Amazon's ability to dominate unrelated industries has actually exposed a vulnerability as it encourages unrelated companies to team up against it. In the same vein, Alphabet partnered with several retailers through Google Express, though that project had limited success. However, in the case of Microsoft, whose domain is squarely in the enterprise IT arena, retailers and other potential Amazon competitors prefer its cloud infrastructure over AWS. Microsoft is not at all a competitor, while Amazon is their biggest threat. What other businesses does Amazon have? While e-commerce and cloud computing are Amazon's two primary business segments, the company has a number of other ancillary businesses, and it faces competition in those areas, too. Most prominent is video streaming, where Amazon offers both original and licensed programming for free to Prime members, or a la carte to others. Describing Amazon's unique model, CEO Jeff Bezos said, "When we win a Golden Globe, it helps us sell more shoes." Prime Video's aggressive expansion has brought it into direct competition with Netflix, the global leader in video streaming. Netflix and Amazon compete for exclusive content, both original and licensed programming, driving up prices companies must pay for in-demand shows and movies. For instance, Amazon outbid Netflix for Transparent, which won a number of Emmy awards, and the two are competing fiercely in India, a fast-growing market of more than 1 billion consumers. However, they have taken different pricing strategies as Amazon has significantly lowered its fee for Prime to encourage people to join the service and take advantage of free two-day delivery, while Netflix's prices more closely resemble what it charges elsewhere in the world. Netflix CEO Reed Hastings has consistently downplayed the threat from competitors like Amazon, emphasizing the vastness of the market, saying that plenty of growth remains. But as the streaming field gets more crowded with the upcoming entry of Disney and AT&T, which now owns Time Warner, the battle between Amazon and Netflix may grow more intense, especially in places like India. Notably, Netflix uses AWS to support its streaming services, indicating it doesn't see Amazon as a threat like Walmart does. Netflix uses AWS for data storage and to "quickly deploy thousands of servers and terabytes of storage within minutes," according to AWS. It would be costly for Netflix to develop its own cloud infrastructure to fulfill that purpose, not to mention be a poor use of the company's efforts and resources. Amazon is now taking on logistics and delivery, posing a direct threat to both UPS and FedEx. Though Amazon is one of the biggest customers for those delivery services, Amazon has taken several steps to start taking delivery into its own hands. 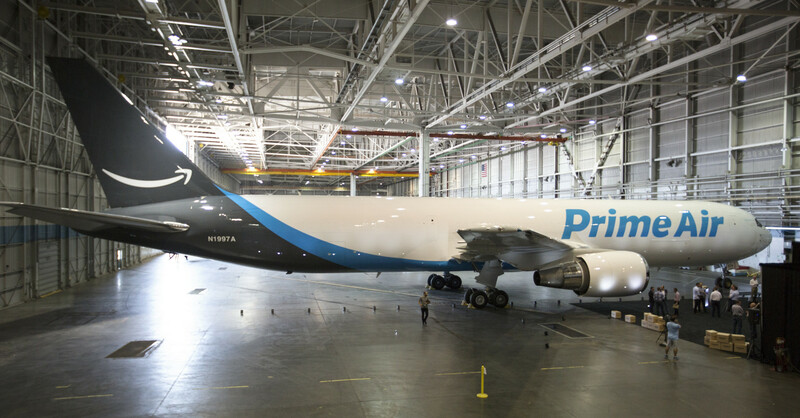 Amazon has leased at least 32 cargo jets from Atlas Air Worldwide Holdings, rebranding them Amazon Air. The company owns 300 semi-trucks and thousands of trailers, and it has also gotten creative with last-mile delivery by hiring drivers under its Amazon Flex program, where drivers use their own cars, and Delivery Service Partners, who drive Prime-branded vans. Amazon has experimented with drone delivery, which has the potential to upend traditional package delivery and broader e-commerce if it goes mainstream (it's still pending regulatory approval by the Federal Aviation Administration). The issue is caught in red tape at the moment, but some Amazon executives are hopeful that drone delivery could get off the ground in some capacity this year. It's unclear how much of a threat drone delivery would be to traditional package deliveries, but Amazon would likely use drones for light packages over short distances, supporting its same-day Prime Now delivery service, meaning it would not disrupt long-haul parcel transportation. So far, Amazon's delivery and logistics business is small, and the company remains highly dependent on services like UPS, FedEx, and the U.S. Postal Service, but in its latest annual report, the company included logistics companies on its list of competitors, a sign of investment to come. Given Amazon's track record as a disruptor, FedEx and UPS may want to consider themselves warned. Amazon has developed many competitors as it stretches across a growing number of industries, and this long list will grow in coming years as the company expands into new frontiers. Its acquisition of Whole Foods brought it into direct competition with supermarket chains like Kroger. Potential expansion of Amazon Go, its cashier-free convenience store, could grow to as many as 3,000 locations and would threaten convenience-store chains like 7-11 as well as fast-food restaurants and even potentially businesses like Starbucks. However, Amazon's next big frontier -- and the industry where it's likely to encounter a whole new wave of competitors -- appears to be healthcare. The company partnered with Berkshire Hathaway and JPMorgan Chase at the beginning of 2018 in a venture to launch a non-profit healthcare company with a mission of slowing the fast-growing costs of health insurance and healthcare that those financial companies cover for their employees. That venture should eventually bring Amazon into competition with a whole range of health-insurance providers and, likely, other players in the healthcare industry. Amazon took another step into the $3 trillion healthcare industry with its June 2018 acquisition of online pharmacy Pillpack for $1 billion, putting it in direct competition with both traditional pharmacy chains like Walgreen Boots Alliance and CVS as well as new prescription companies like ExpressScripts. Considering Amazon's strength in e-commerce, Pillpack looks like a good starting point as it searches for a beachhead in healthcare. Amazon is also selling more and more medical supplies through Amazon Business, and it's hopeful that Alexa can play a role in healthcare. For now, that may just mean reminding you to take your pills, but there are ample opportunities down the road for voice technology in the healthcare space. Considering the enormous size of the healthcare industry and the high level of consumer dissatisfaction with it, the sector seems particularly ripe for Amazon's unique approach to industry disruption. The company has kept customer focus at the heart of its mission since its nascence, and customer satisfaction has been a hallmark of its brand throughout its history. Amazon's invasion may not happen overnight, but healthcare companies should expect to eventually find themselves among Amazon's biggest competitors. John Mackey, CEO of Whole Foods Market, an Amazon subsidiary, is a member of The Motley Fool's board of directors. Suzanne Frey, an executive at Alphabet, is a member of The Motley Fool's board of directors. Teresa Kersten, an employee of LinkedIn, a Microsoft subsidiary, is a member of The Motley Fool's board of directors. Jeremy Bowman owns shares of Amazon, Facebook, Netflix, Starbucks, and Walt Disney. The Motley Fool owns shares of and recommends Alphabet (A and C shares), Amazon, Apple, Berkshire Hathaway (B shares), Etsy, Facebook, FedEx, Netflix, Starbucks, and Walt Disney. The Motley Fool owns shares of Microsoft and has the following options: long January 2020 $150 calls on Apple and short January 2020 $155 calls on Apple. The Motley Fool recommends Costco Wholesale, CVS Health, and eBay. The Motley Fool has a disclosure policy.